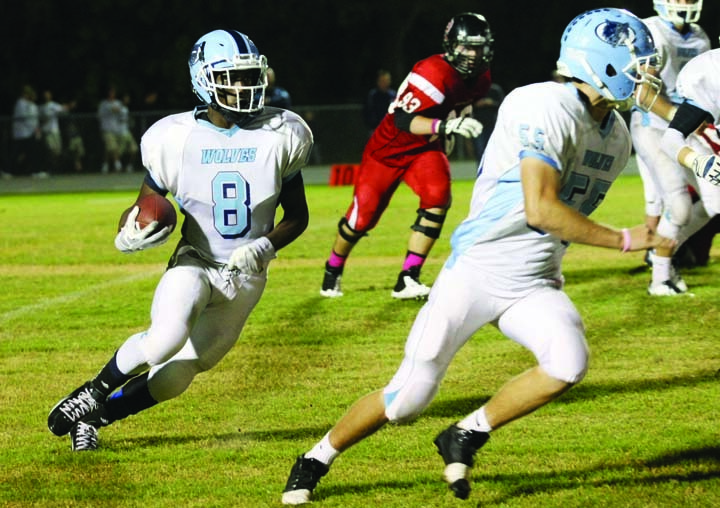 Newsome Wolves junior Chris Bryant runs the ball for a 4 yard touchdown in the second quarter during a recent district game against Bloomingdale. It has been five years since Bloomingdale football sported a winning season, and as many years since the Bulls had a shot for a playoff berth. But for their fans delight and, for the first time since 2004, Bloomingdale beat Newsome, 24-10 in a season changing Class 8A, District 6 matchup. Bloomingdale began the scoring at Charley Harris Stadium, thanks to a field goal by Lucas Jose, which stirred the home crowd. But its was Bulls senior Chris Wonsley’s 65-yard interception for a touchdown in the first half of the game that got all the fans on their feet. Just minutes later, Logan Crouse, who caught seven passes for 70 yards, scored a touchdown on a pass from Tommy McLaughlin, which put the Bulls at 17-7 at the end of the first half. 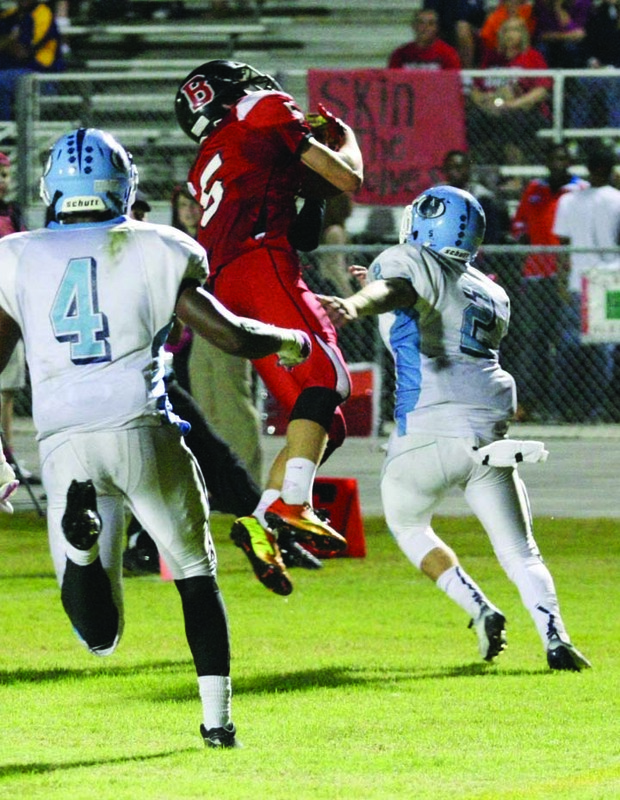 Bulls junior wide receiver Logan Crouse catches a pass from Tommy McLaughlin, scoring a touchdown against Newsome. To seal the victory, Bulls senior, Alan Yearby picked off a Newsome pass and returned it for a 52-yard interception touchdown midway through the fourth quarter. McLaughlin managed to completed 16 of 26 passes for a total of 134 yards and a touchdown. Newsome got on the scoreboard on 4-yard run TD in the second quarter by Chris Bryant, while Austin Cobb added a 40-yard field goal in the fourth quarter. “You can feel the excitement in our school,” Booth said. “This is our season. It means something for our teachers, students, and our administration, all of whom have been giving so much to the program over the years. For more information about the Bloomingdale Bulls football program, please visit www.maxpreps.com.